For the first time in my life, I have ended up on the right side of a flight cancellation. My husband, Kevin, and I usually get stranded in a busy airport, or never even leave home. 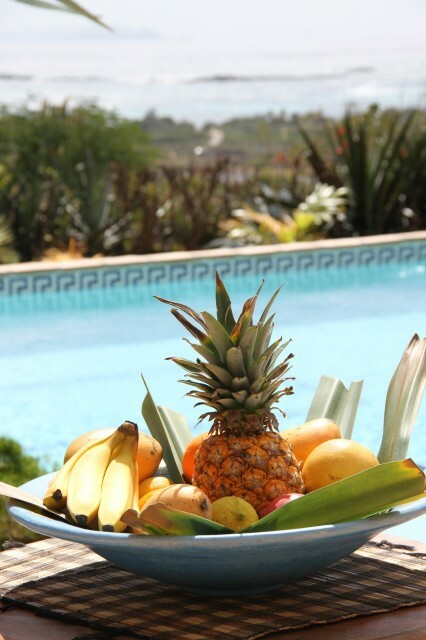 Now, because of winter storm Nemo, we are trapped in paradise – the beautiful Caribbean island of St. Martin. We love this amazing place, and can never soak up enough sunshine before returning home. A four-day delay feels like the snow day to end all snow days! We were fortunate with our accommodations as well. The aptly named Casa del Sol was available, and our gracious hostess kindly extended our stay. Veronique provides little surprises for us before our arrival in St. Martin. This visit was no different, with some rich Arabica beans tucked next to the espresso maker, an overflowing bowl of lush, tropical fruit, and an icy chilled bottle of champagne in the fridge. What better way to spend my exta time than experimenting with new recipes? (Last time we were in St. Martin I made Piña Colada French Toast . Poking around the charming Provençal kitchen, I was delighted to find a copy of the colorful, island recipe-packed Creole Recipes and Cocktails from the Caribbean. Flipping through the little cookbook, Exotic Fruit Crumble popped out. The name was perfect, and we also had mangoes and bananas in our fruit bowl. I skipped the coconut (Kevin doesn’t like it) and added some vanilla rum (hey, we’re in the Caribbean). A few other little changes, converting everything from grams to US measures, and my little tropical crumble was ready for baking. After the dish baked for 40 minutes in a hot oven, Kevin and I were enjoying an exotic, Caribbean delight. If you’ve never tried cooked mangoes, you’re in for a delightful discovery – flavors sweeten and meld with baking, become reminiscent of peach pie, yet still remain startlingly light and bright. So, if you can’t be trapped in paradise, pick up some luscious mangoes and ripe bananas, and make yourself an exotic breakfast in bed for two. Just in time for Valentine’s Day. Preheat oven to 400°. 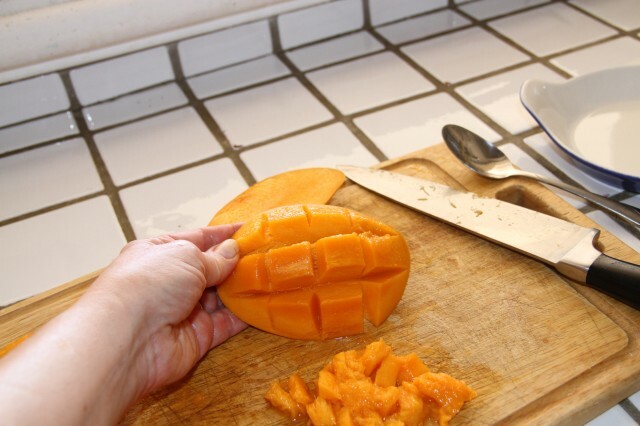 Hold mango lengthwise, and with a sharp knife, slice through just to one side of the pit. Turn mango, and carefully slice through on the other side of the pit. Chop off the sides remaining around the pit. Score each sliced piece lenghtwise into several long, thin slices, but do not cut through the skin. Score again crosswise to create small cubes. Repeat with other mango section. 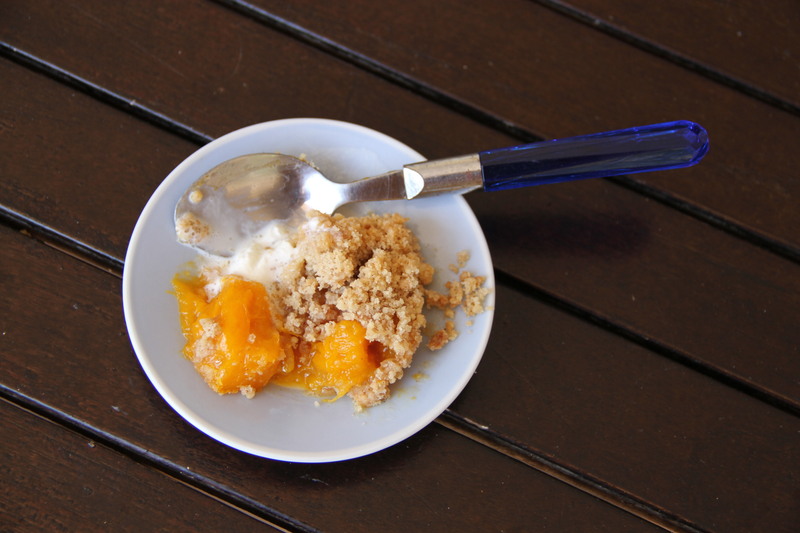 Scoop scored pieces out with a spoon and place in small oven-proof dish. Skin and slice banana. Add to dish containing mango pieces. 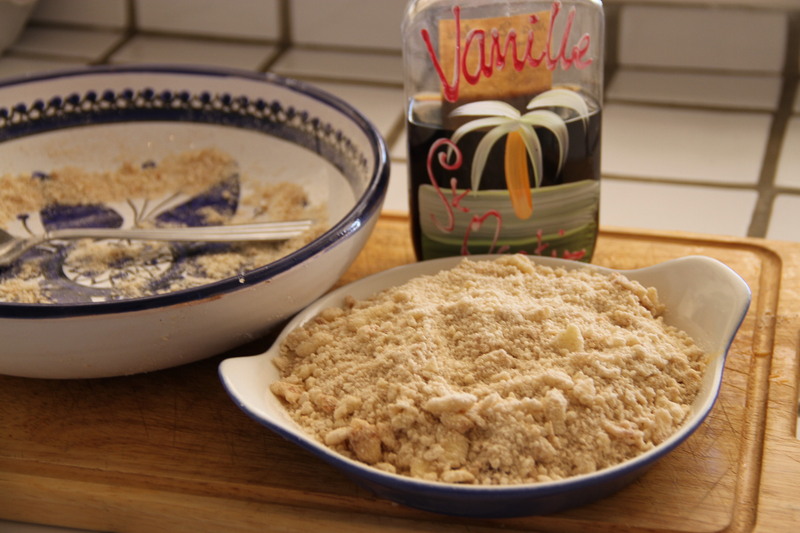 Pour vanilla rum over fruit and stir to mix. Set aside. In a separate small bowl, mix together flour, butter, sugar and cinnamon until crumbly. Spread evenly over fruit mixture. 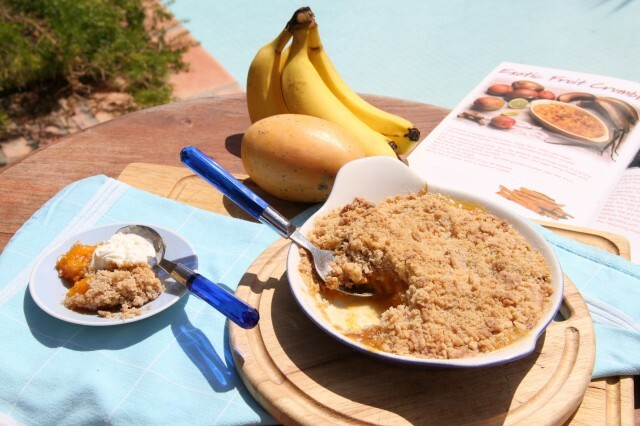 Bake for approximately 40 minutes, until topping is lightly browned and fruit is cooked through. Serve hot with a dollop of whipped cream, if you like. In looking for ways to take my own bedroom design advice and begin again, I started assessing the contents of my bedroom. What do I love? What feels not-so-much? After taking a visual tour of the space, my eye kept getting stuck on my bedside lamps. 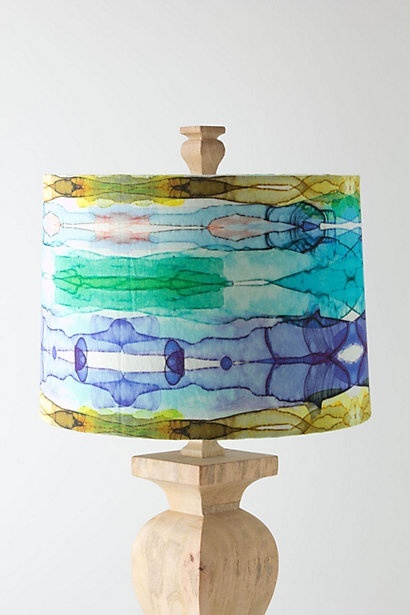 The base of each lamp is fabulous (I am not humble about my own good taste), but one of the lampshades felt particularly ho-hum. 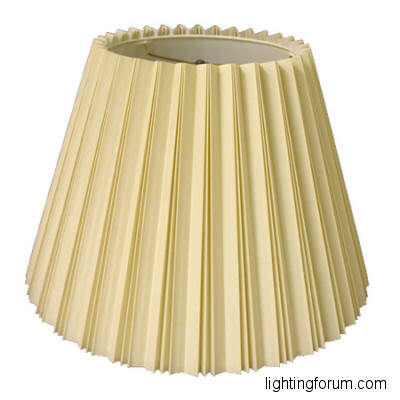 The first lampshade: Ordinary. Hard to clean and rapidly yellowing (gross). Similar to the one pictured below. 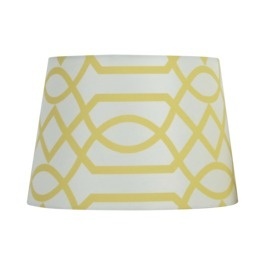 The second lampshade: Ombre glory. Sea and sand magic. Knowing it wouldn’t fit in my suitcase I put my ownership ambitions on hold and hoped that the lampshade could also be found at my local store. When I arrived it was in stock and for a cool 23 bucks it became MINE. And you know what? This little change has made all the difference. It easily took my bedroom design up a notch. 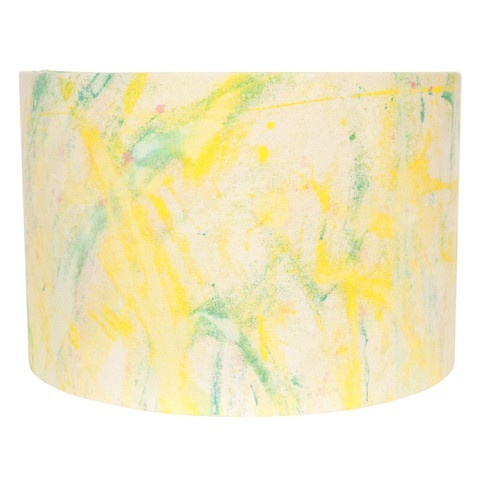 When in doubt, try a new lampshade! Really. Setting my sights on subtle bedroom design upgrades has proven to be transformative and oh-so-very pleasing. What can you switch up? 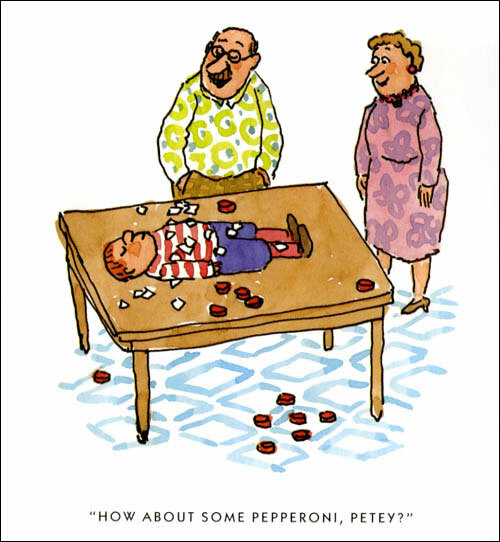 Pete’s a Pizza by William Steig. It’s rainy. Kids want to go outside and play with their friends but they can’t. They get grumpy. They are too bored to do anything. They just want to sit around and scowl and mope. Pete is scowling and moping because it’s raining. Pete’s dad isn’t bored. He is hungry. So he decides to make Pete into a pizza. For most of the story, we are watching Pete’s parents as they make him into a pizza, from sprinkling him with flour (it’s really talcum powder) to covering him with tomatoes (they’re really just checkers) and placing him in the oven (just the sofa). Despite himself, he can’t help laughing as he gets tossed and stretched like a ball of dough. It’s a funny story that little kids are sure to get a kick out of. It also offers a glimpse into all the ridiculous things you can do with a crabby bored child to get him/her out of his/her crabby mood. Who knows? you might just feel better yourself! Though I am by all means a homebody, I am by no means a housewife. I realized this specific distinction whilst watching an 8-hour marathon of Bravo TV’s “The Real Housewives of Beverly Hills” this past weekend. There, in that gilded cage known as reality television, Botoxed women with breasts, Birkin bags, and bucks a’plenty show little regard for sanity, sobriety, or civility as they compete amongst themselves for the adoration of a tweeting fan base. As I unceasingly observed them from the comfort of my bed/infirmary, their tantrums over issues such as petty gossip, suicide, book deals, and the loss of one’s husband to Leann Rimes began to really hit home with me, disrobing me of the veil of judgment I was all too happy to wear in their honor. Now, mind you, I have never lost a lover to a country chanteuse. For that matter, I’ve never been to rehab, had a former career as a dancer on Club MTV, nor have I willingly injected anything into my face—unless you count that time in 1988 when I made my Mom take me to Claire’s Boutique to get my ears pierced because I wanted to look like George Michael. What I do know all too well, however, is the unyielding pressure of scandal, sass, and scintillation that accompanies a personality too big—too glamorous, really—for everyday life to contain on its own. Instead, it must be documented for the world to see!! 7:30AM – Wake up. No one is waiting for me with a bathrobe. I have to make my own coffee. It’s too cold. Have to microwave it. Now it tastes like the Tikka Masala leftovers we had a couple of days ago. 9:00AM – Thought about exercising. That was fun. Watched a cooking show instead. 10:00AM – Gonna get into the shower now. Oh, wait… The View is on. 11:00AM – I still haven’t talked to anyone today. My better half is STILL asleep. I’m still thinking about exercising, but now it seems like a chore and I’ve already unloaded the dishwasher, so that’s more than enough for the day. 1:00PM – I ate an apple. Because I was feeling naughty, I had it with peanut butter. Thank goodness all my blinds are closed or the paparazzi might see me awkwardly slumping here on my couch. 2:00PM – Finally left the house to buy toilet paper, deodorant, and groceries and noticed that there are an inordinate amount of children out on the streets. Oh god, it’s a holiday. That’s it. I’m going back home. The hummus can wait. 4:30PM – Wish I had bought that hummus. 6:00PM – Just watched a documentary on North Korea and followed that with one on Bigfoot. Two mysterious entities no one knows much about. I’m already in my pajamas. 8:00PM – Maybe I’ll call my editor. He’s not answering. I leave a message that makes me sound morose when, in fact, I’m really just bored. 9:00PM – I love my DVR, but I’ve seen all of these episodes of Four Weddings already. I have a moment of hating myself for allowing this to actually be a problem, but the angst is extinguished by my decision to watch that DVD of My Super Sweet 16 I procured from my parents’ house. 11:30PM – I just opened a bag of chocolate chips and ate a handful because we have nothing sweet in the house. 11:35PM – I eat another handful, but try to put too many in my mouth at once and a bunch of chocolate chips fall onto the floor. I’ll sweep them up tomorrow. 12:00AM – I guess I should go to bed. All this glamour has tuckered me out. Dangit, I forgot to make the bed and the sheet is somehow twisted in a knot and on the floor. Life is so hard! 12:15AM – The walls of my apartment are thin and the reclusive neighbor next to me snores really loudly. It’s like he’s reaching out for a friend, but deep down I know he isn’t. 12:30AM – Maybe my coffee will taste like coffee tomorrow. Good night. As you can see, dear readers, while this day was action-packed, it nonetheless lacks that certain “something” that makes a housewife a HOUSEWIFE. Thank goodness, then, for Bravo’s bevy of beauties and their critical role as spokeswomen for the secret stars in all of us. In-between all those times I was vomiting into a paper bag, they made this weekend a real winner. While most people have a general idea of the way they want their bedroom to look, many use the wrong words when trying to describe this vision to other people. While minor differences in terminology go mostly unnoticed when talking amongst friends, the same words carry distinctly different meanings to professionals in the design community. To help you nail down the terminology, we’re going to discuss contemporary, modern, and traditional design and the main differences between each. 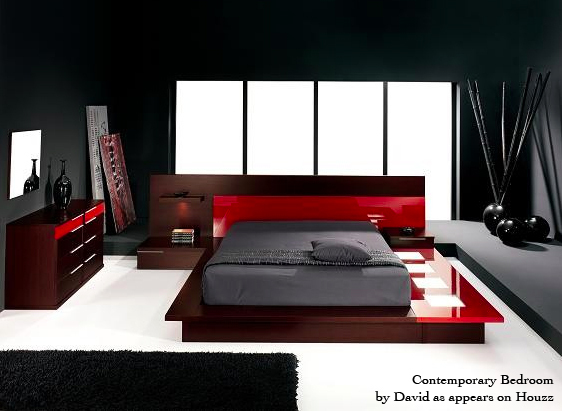 Contemporary design, also called transitional design, can be described as a mix of modern and traditional design. Unlike modern design, which describes a specific style from a particular era, contemporary design embodies what is “in” today. Indeed, the word contemporary means “with the time, “or “modern, characteristic of the present.” Contemporary can even be further described in terms of its geography. Thus, today’s contemporary design in California may be very different from today’s contemporary design in New York. Some of the cornerstone elements found in contemporary design today include shiny, reflective surfaces like glass and stainless steel. Contemporary furniture is a bit bulkier and more rounded than modern furniture, but is more minimalistic than traditional furniture. Contemporary design often features very artistic lighting fixtures, which are commonly used as the statement piece in a room. Modern and contemporary design are often confused and while they are similar, modern design refers to a specific era of design while contemporary design changes with the present. Modern design refers to an era of design from the mid 20th Century (1920s – 1970s) and many of the most famous furniture pieces and designers from this era are referred to as 20th Century Classics. 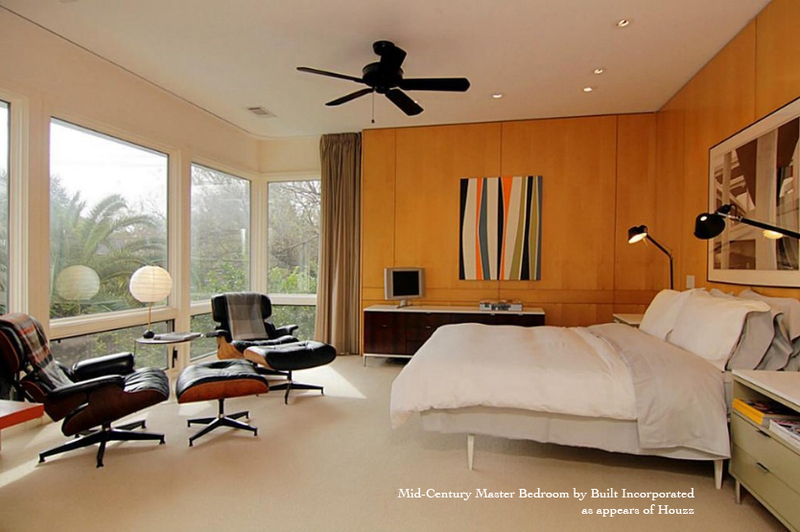 Modern design incorporates clean lines, bright and open spaces, and the use of natural materials. During the mid 20th century, the idea of “form follows function” was prominent, and you’ll find that modern furniture is surprisingly comfortable—even if it doesn’t look like it will be. While it’s rare to confuse traditional design with modern or contemporary design, it’s important to briefly hit on traditional design since contemporary design often blends traditional with modern. Traditional design often uses heavy, bold furnishings with rich earth tone colors such as brown, gold, or dark green. 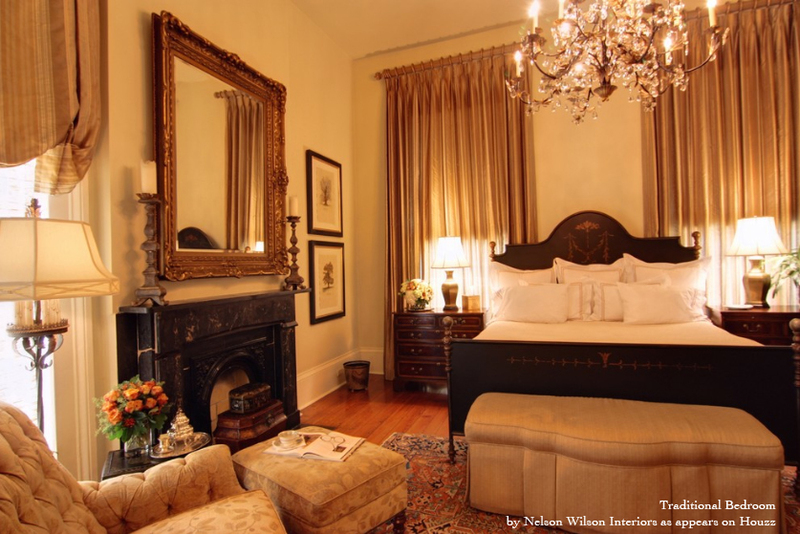 Traditional design is very ornate also, for example: claw foot chairs and embellished four post beds. Traditional pieces draw their inspiration from 18th and 19th century Europe. If you can picture it in a castle, it is likely traditional. So there you have it: a brief introduction to contemporary, modern, and traditional design. Understanding the differences between these design styles, especially modern and contemporary, is important when describing your vision to interior designers, furniture sales people, and other members of the design community. As always, the best way to get a feel for design is to see how other people have done it. What type of style do you like? What elements do you feel distinguishes these different design styles? Let us know in the comments below.